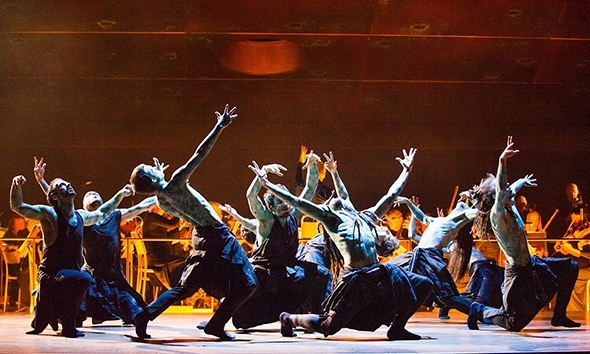 Hofesh Shechter’s directorial role in the Royal Opera’s production of Gluck’s Orphée et Eurydice is part of a month-long season of Schechter works under the modest moniker Hofest. The titles of choreographic works on the Hofest bill — Degeneration, Political Mother and Barbarians — seem worlds away from Orphée et Eurydice; what links them is Schechter’s ability to summon up tortured, angst-ridden furies, who in Gluck’s opera inhabit the second act underworld. But this leaves two acts in which his dancers are called on, along with the Monteverdi Choir, to be shepherds and nymphs lamenting with Orphée over the death of his wife, Eurydice, or celebrating the victory of love over death in Act 3. Neither pastoral lamentation nor joyous celebration are particularly Schechtian subjects. In the opening of Act 1 his dancers are on their best behaviour, however, sharing simple gestures of grief with the choir in harmony with Orphée’s first aria. There is a magical moment where the fluid bowing of the violinists above merges with the fluid gestures of the mourners below. As the first act develops, however, the dancers default to the familiar Schechtian mode of movement — Shechter has imported his own company and members of his junior company to fulfill his choreographic role — that distances them from the chorus to the point of creating two distinct artistic entities. From here the dance and the opera part ways; in the dance of the blessed spirits there is a sense of calm but the earthiness of the steps drags down the ethereal charm of the music, and when Eurydice appears in Elysium, her ‘cheerful home’, the dancers manage at best to look sullenly depressed with their heads down and shoulders hunched over. This unsettling imbalance is lost on the two directors of the opera, one of whom is the Associate Director of the The Royal Opera, John Fulljames and the other is Schechter himself. He has not only imported his dancers but also his lighting designer, Lee Curran. After the pencil spot on Juan Diego Flórez as Orphée flashes three times in the dark like an errant cue after the curtain rises, the first impression of the set in full light is visually stunning; the orchestra floats above the middle of the stage as if on the private deck on a sumptuous liner and the three trombonists stand on a separate, spacious plane above them. Below the orchestra, among the columns of the hydraulic stage, wander the chorus and dancers. Curran is at his best in creating a dramatic sweep of light in productions in which movement is central. He gives this production a feel of calm suspension, but it is in his treatment of individual singers that he falters. Amanda Forsythe as Amour looking like a cabaret singer in a golden suit too often merges into the soft golden tones of the orchestra around her and the lone figure of Flórez on the forestage in Act 3 sings in shadow (he may simply have wandered too far forward on the extended apron) while the vast, empty upper planes of the stage above the orchestra are bathed in light. It is an odd inversion of focus that detracts from Flórez’ superb singing. Conor Murphy’s stage concept promises much on first view but is shot through with inconsistencies. It also places the production’s design at the service of the dance over the central role of the orchestra. Not only is the conductor placed in the middle of the stage where he cannot see his soloists or chorus for most of the time (nor they him), but any sense of cosmological order — where the floating orchestra might indicate the upper world and the sunken orchestra the underworld — is subverted for logistical reasons. When Orphée arrives in the underworld to meet Eurydice the orchestra is appropriately below the level of the stage, but it has to rise to let Orphée cross through the musicians from the back to the front of the stage to sing. At the end of Act 2 the orchestra is still level with the stage, but at the beginning of Act 3, which follows on scenically where Act 2 finishes, the orchestra has been buried in a bunker. What happened in the intermission? There is no record in the program as to what John Eliot Gardiner thinks of his placement on the stage or of the merciless rising and lowering of his orchestra in this production. Fulljames insists he and Schechter ‘have understood John Eliot’s thoughts about the structure of the music and borne those in mind as the production has evolved.’ This eloquently suggests the production was designed with the orchestra, the chorus and their conductor but not necessarily to their advantage. The inconsistencies of the production values, however, are nothing compared to the effect of Schechter’s choreography in the extended dancing scenes of Act 3. The divide between opera and dance is at its nadir; all hell lets loose as if the furies have been set free as well. In its overwrought self-indulgence the celebratory atmosphere is pulled down to the stamping, grunting level of the underworld from which not even the elegant forces of Gluck’s music can pull it back. I left the auditorium with a sinking feeling that all the efforts of Orphée and his victory of love and music over death had been in vain.